The picnicking is getting out of control. Between park concerts and outdoor movie screenings, an average of two dinners per week are currently being replaced by cheese and wine consumption on blankets in the grass. And cheese is magnificent. But in the interest of holding one’s own amid the svelte ladies on New York’s sidewalks, one’s weeks ought not to be measurable in wheels. Not to mention the torn-off-hunks of crusty loaves, and the fistfuls of grapes, and the marinated olives, and the paper-thin-sliced ham, and the night-cap chocolates that go hand in glove with dinners revolving around cheeses. So salads are becoming a priority. 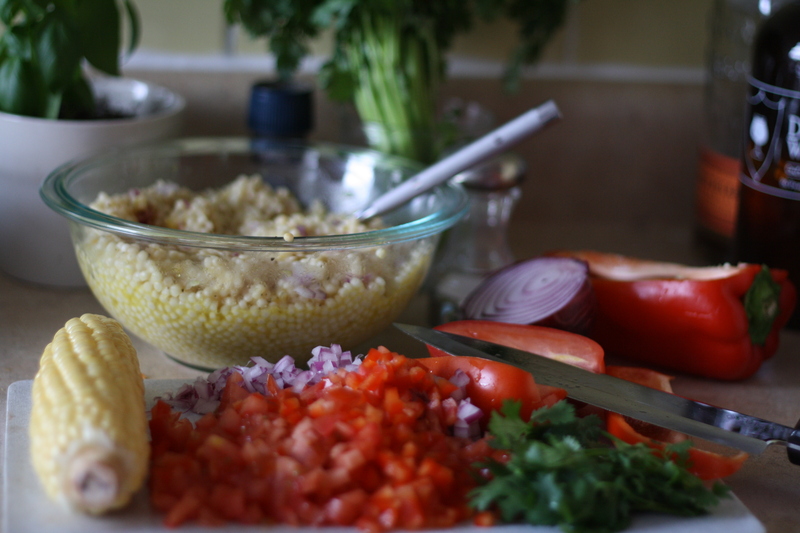 This week I had my first adventure with Israeli (or pearl) couscous, one I’ll absolutely be repeating. These glorious beads of semolina are so pleasing to the eye and the palate, quick and easy to prepare and a versatile vehicle for all manner of seasonal produce. I scouted online for a recipe via my new addiction and recipe collector, Pinterest. The one I ended up choosing, based on simplicity, ingredient availability and sheer prettiness of pictures, was from Sunday Suppers. SS is a Williamsburg-based outfit started by photographer Karen Mordechai. It combines cooking classes and convivial atmosphere, with a focus on gorgeous styling and hearty whole foods. I’m a huge fan. The pearl couscous was far quicker to prepare and smoother to eat than the pearl barley I tried in a salad last week, but then its wheat and semolina are more refined and so it’s not quite as great for your insides. Add plenty of fresh vegetables and herbs though, and I think you’ve still got a dinner/side to feel smug about. 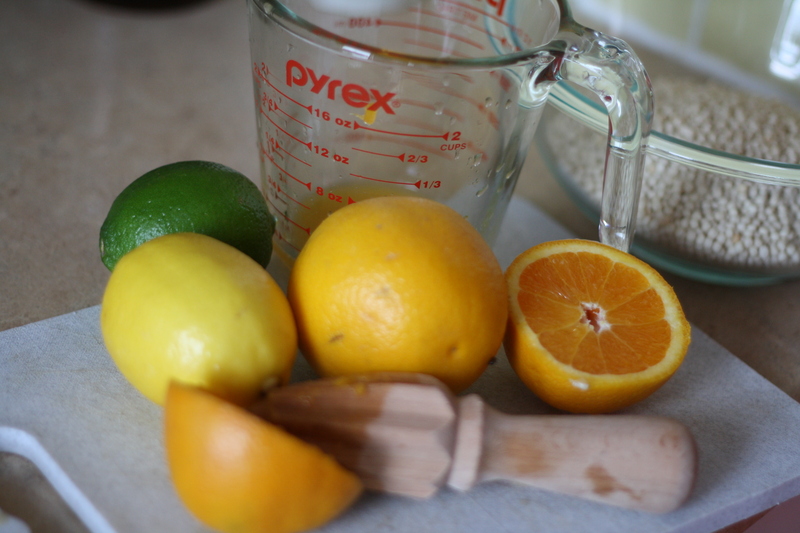 I love the lightness of the citrus dressing, as opposed to the usual stock for couscous. In a saucepan, melt the butter and add the orange, lemon and lime juices. I only had enough oranges for 1 cup of juice and added ¾ cup water, which worked just fine. Add a splash of vinegar (I didn’t have white so I used rice vinegar) and a lick of olive oil. Season with a pinch of sea salt and cracked pepper. When the liquid is boiling pour it over the couscous in a big bowl. Stir with a fork and then cover the couscous with plastic wrap and let it sit for 10 minutes or so. 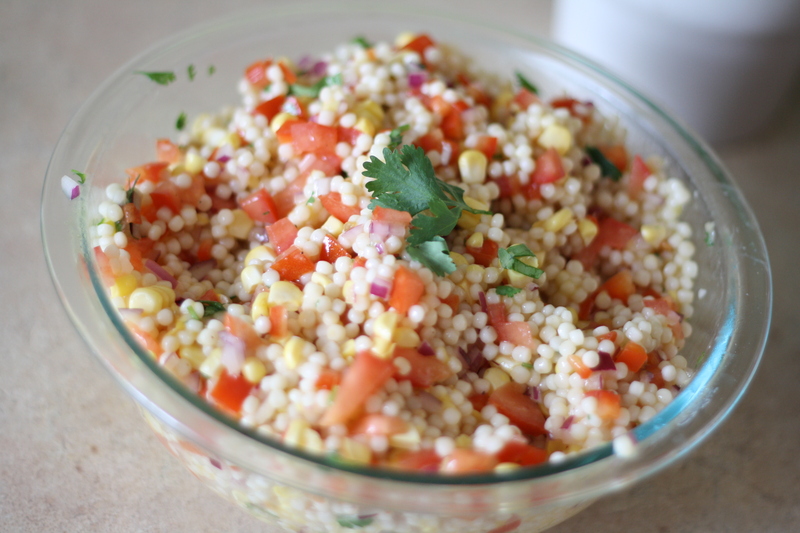 When most the liquid has been absorbed, fluff the couscous with a fork and add the finely diced onion, tomato, capsicum, herbs, almonds and the corn kernels. You could use any combination here – I’d like to try it with sliced snow peas or sugar snaps and diced zucchini. Taste for final seasoning and serve warm or cool. Fresh and delicious!